With the Los Angeles Jr. Kings’ and LA Lions’ “Match Game: The Play for Sixty K” fundraising challenge hitting the home stretch – the clubs were only $17,160 away from reaching their end-of-the-year goal as the calendar turned to December – the organizations have wasted zero time moving a good chunk of the money already raised directly on to their families. 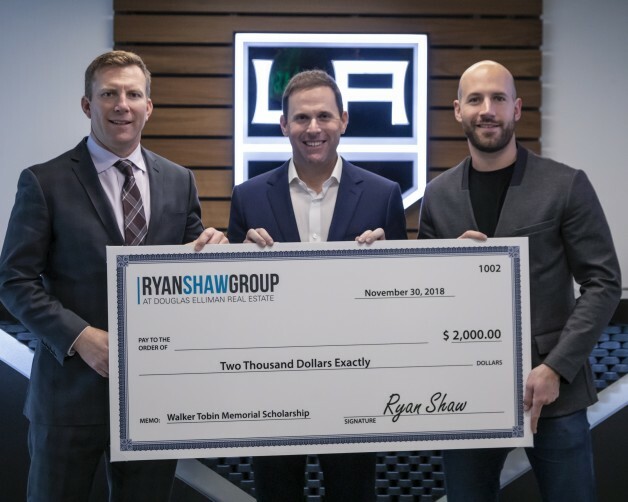 Thanks to the generosity of the South Bay-based Ryan Shaw Group at Douglas Elliman Real Estate, its $10,000 contribution to the “Match Game” initiative was targeted straight to eight members of the Jr. Kings and Lions who were recently awarded the first annual Walker Tobin Memorial Scholarship. The unsuspecting recipients, who were recognized with their awards at a surprise presentation in the Los Angeles Kings’ board room at El Segundo’s Toyota Sports Center on the evening of Nov. 30, were chosen based on their strong character and leadership skills, both on and off the ice, along with their need for financial assistance. The recipients included: Nic Gonzalez of the Jr. Kings’ 18U AAA team; Justin Scarbrough of the club’s 14U AAA1 squad; Carter Ochoa of the 12U A2 club; Rowan Anthony, Alicia Gomez, Kayla Grohman and Bailey Mollet of the Lions’ 10U A team; and Blake Romo of the Jr. Kings’ 8U A1 team. Ryan Shaw, a Southern California native who played hockey growing up and is a former Los Angeles Kings employee and El Segundo Regents/Jr. Kings coach, along with Brett Beebe, also Southern California born and bred and a former player and now coach within the Jr. Kings program who works alongside Shaw at Douglas Elliman Real Estate, moved the scholarship initiative to the forefront after the sudden passing of their mutual friend, Walker Tobin, back in September. Beyond appreciative of Shaw and Beebe, Sorensen is confident their generosity will spark a flame for more individuals and companies to come forward and support the efforts and needs of the club’s families. And Shaw is equally grateful for the chance to give back to the local hockey community.